This weekend Canada celebrates what art means to their country, and I am very proud to be a part of the Governor General’s Performing Arts Awards. Mind you, they’re keeping me busy! A full day today with meetings, reception at Parliament Hill, sitting in on Question Time, a rehearsal for Saturday night’s Gala, and then a dinner with close friends. Tomorrow is the big ceremony at Rideau Hall, the official residence of the Governor General (it will be great to meet our newly-appointed one, the former astronaut Julie Payette) when I will receive my Lifetime Achievement Award. Then on Saturday it’s the Gala performance at our National Arts Centre—but of that I will say no more as it’s top secret! It will in any case be a chance to see many wonderful friends and celebrate Canada together. But that’s only one thing on my mind at the moment. I flew here from Japan, and am struggling to recover from jet-lag and learn ten million notes at the piano at the same time. People have no idea the amount of practising and mental work that is involved. My biggest priority at the moment–other than the six programmes I am soon playing in the Trasimeno Music Festival in beautiful Umbria, Italy—is the work I must do on Messiaen’s huge Turangalila Symphony that I am playing at the BBC Proms in London’s Royal Albert Hall on July 18th. That will be quite an evening! My foot is much better and I am now walking without a stick, though I feel an ache with every step. Physio is helping and I can now do a decent job of descending most staircases, though I go everywhere very slowly. By the end of the day it’s pretty tired. Still more patience required with that. I’ve been to so many places since I last wrote—among them Finland and Japan. 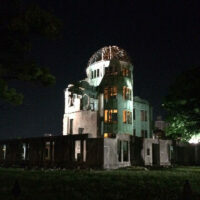 It was very moving to see the Peace Memorial Park in Hiroshima with the A-Bomb Dome lit up at night (see photo). An experience I shall not forget. Plus I have a new Beethoven Sonata recording coming out tomorrow: four more Sonatas on the Hyperion label, including the “Tempest” and his beautiful Op. 109. These recordings are so important to me—they represent how my work has evolved over the years, and each one is like the birth of a new child. I hope that people can listen to the complete album as a recital, and not just a track at a time. That’s not the point. It’s a complete experience! If you would like to come to the Trasimeno Music Festival (29 June to 5 July), please visit our website and book tickets here. There is nowhere more beautiful to listen to music in the company of like-minded people from around the world.